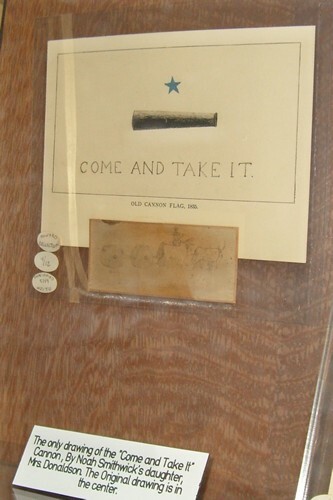 Gonzales' come and take it cannon. Read four history books about the Texas Revolution and you'll have four versions of what occurred on October 2, 1835. They've pretty much settled on the number 18 for the Gonzalans present, but the numbers of Mexicans varies as does the cannon's composition. Sometimes the cannon is brass, sometimes it's iron. Sometimes it makes it to the Alamo where it was melted with the other cannons after the fall, and sometimes it's buried en route. One thing is for sure, Dr. Pat Wagner, who came into ownership of the cannon, spent many many months working with Doug Kubacek of Hallettsville to verify the pedigree of the gun, which now sits in the museum in Gonzales. The cannon had been lost, but very close to the Texas Centennial (almost to the day) a flood of the Guadalupe revealed the cannon you can see today. Dr. Wagner and Come and Take It Cannon. Courtesy of Gonzales County Archives X-rayed and magnified, to the point of using the huge x-ray machine at an airbase in San Antonio, both Dr. Wagner and Doug Kubacek confirmed that this was a cannon made by a blacksmith in Gonzales, since they had access to a detailed diary the blacksmith kept on the repairs done to the touch hole. Although it is portrayed in many different forms, a flared barrel, a different carriage and sizes from small to 2XX, it still is a tidy bit of work. Even if it doesn't measure up to legend, that doesn't take away from the fact that this was the defiant act that sparked the revolution and this cannon was the instrument. Dr. Wagner passed away early this year, but he generously allowed the cannon to be shown around the state where it could be seen by a greater audience. It now resides at the Gonzales Memorial Museum. 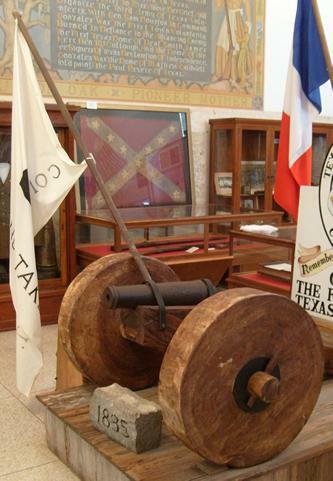 Those of us who love Texas history can thank Dr. Wagner for the little cannon that is presently on exhibit at the Gonzales Memorial Museum. Jack "The Knife" Murphy demonstrating the ease with which the cannon could be concealed.